It was the age of innocence. 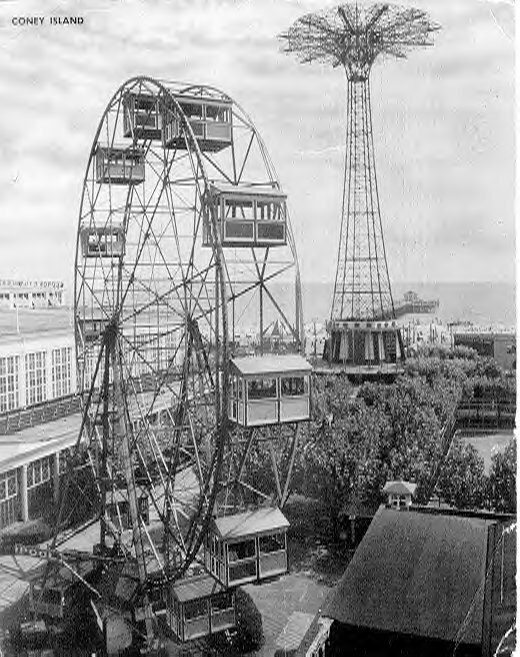 The little battery powered transistor radio played "Sherry" and "Under The Boardwalk". Girls had to wear skirts to school, and boys had to have on a white shirt and tie, or they couldn't go to assembly.... (what a threat!) If you were lucky the Million Dollar Movie would have an Abbott and Costello movie on that week. You could watch it everynight, and twice on Saturday and Sundays! I remember seeing Cagney so many times in Yankee Doodle Dandy, that I knew not only the songs, but all the dialogue by heart. Why is it that to this day when the young marching soldier asks Cohan, (who he didn't know wrote the song and just got the medal of honor from the President), "don't you know the words oldtimer?".... I still cry? We waited on line for hours to get scared to death by the Tingler in our very own movie theatre! Wore silly 3D glasses for 13 Ghosts, and sneaked in sandwiches our moms made us because the candy was too expense at 25 cents. Who was better? Mickey, Willie, or the Duke? The damn Yankees always won anyway, maybe thats why they had so many fans? We played..... hell..... we LIVED in the streets. Sun-up till dinner time, then back out again. Hot sweaty summer nights with the smell of the salt air burning our heaving chests from running around. Then like the shiny white knight, came the incessant musical jingle of the Mister Softee truck. A cool respit. Time to sit on the stoop and eat, and fight about which was better. Carvel, Mister Softee, Good Humor? We fought about everything didn't we? We didn't know it then but we were honing our skills for the real world. Soon after someone would yell out a game and instantly we were fighting about "good sides". "Thats not good sides.... you'll kill them with all the big kids". So we would have to chose sides. How to choose? Another fight! In reality all this was a ballet of sorts, to be passed down from the older kids to the younger ones, so they too would know how to handle a crisis..... Like when a stickball court was occupied, and you wanted to play? You would "challenge" of course! But to properly do this you needed 2 balls? Why? Who the hell knows? Late at night my dad who was not a terribly educated man, would send me down to the corner store to intercept the truck delivering the Daily News and the Mirror. He had to have both for some reason. As the truck approached, the gigantic letters on the side billboard screamed out "SUPERMAN DEAD". We all looked at this puzzled? How the hell can this be? We all read the comics fiercely and knew it was only Kryptonite, and the green kind, that could remotely do this. We started to argue, some of the younger kids getting very upset. We grabbed the 1st paper off the stack and read the headlines briefly and quickly opened the page. The actor George Reeves found dead. Suicide suspected. How could this be? Why would he kill himself.... why would anyone? Especially him. Afterall he was Superman..... err played him at least. By the next day it finally registered that an actor who played the guy on TV, that still looked young on the reruns we were watching, took his own life. Depression they said............ The age of innocence was over......... Superman was dead! There were several types of stickball games, and balls. The oldtimers played on the streets from sewer to sewer, dodging cars. For me the only kind of stickball was fast pitching against a wall. I was an awesome stickball player. On the fly, against a wall, into a chaulk box. That was a real mans game. You had to pitch, hit and field. When we were young our arms were like rubber weren't they? I could pitch 2 or three games everyday it seems. 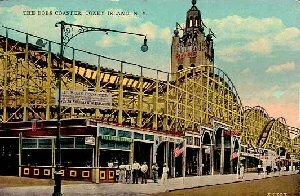 Used to love the park on 27th street in Coney Island. If you really got a hold of one, it was going.. going... gone... into the CYO across the street. I never had the real great fastball, but I could make that Spaldeen dance. Curves, sliders, screwballs, sinkers, changes. I would dig my knuckles into the ball and squeeze it tight and the ball would head right for the heart of the plate and at the last second dip and hit the ground, while the batter always chased. The ball of choice was a "Spaldeen", or more correctly spelled on the ball as a Spaulding. Since the box was made of a thick chalk line, many ball and strike disputes were settled by a fresh chaulk line on the ball. The ball moved so damned much, that a batter was absolutely sure that a thrown ball would hit him, while it curved effortlessly into the box for a strike. A real good batter would choke up and keep fouling off dozens of pitches to tire a guy out. I was also a switch hitter, with no power lefty, but I did it to foil that great curve that some could make break 3 feet. By the 60's you could buy a stickball bat for a $1 at the toy store. It was straight and thicker that the old broom handles we used to use. It also had a spiral of black tape up the handle. I still have mine somewhere. It was one of my most important posessions. Several times a game someone would hit one on the ground at warp speed directly at you. It usually had tremendous spin on it. What a challenge not only to reach it, right after you just threw the ball and were off balance, but also hold it in your hands while it was still spinning. I also remember something we called an "egg" ball. This was a pop up back to the pitcher that was somewhow spinning really fast with the ball kind of sucked into itself as it tried to escape your grip. We would play 1 on 1 or as many as 5 men on a team , with the outfielders rarely getting 1 ball to field. The fly balls were either pulled very foul, or were hit a mile, and lost forever. A typical game was 5 or seven innings and the score was about 18-16 by the time all the balls were lost. I can remember playing against both my older brothers on the morning of one of their weddings. I was about 16 and they were 24 and 27. I struck them out and hit a homerun, and as far as I was concerned, that was the day I knew I was a man. My pals and I were walking the boardwalk absolutely tapped out. I mean between the 4 of us we had zero money. We walk up to one of the telescopes that you have to pay 10 cents to see the boats on the ocean with, for about 10 minutes. This machine was obviously for the tourists, cause there was no way in hell one of us Coney Island boys would ever give up a whole dime to be a Peeping Tom. We could peek through the wall slats of one of the bathhouses for free to do that. We look into the lenses which were blackened and closed up. Finally we find one that is working! Someone must have just been there, and walked away before the 10 minutes were up. We fight to take turns looking at nothing at all. The thing keeps on going. I mean it won't stop. We think we have just discovered ice cream. Boy are we getting away with murder or what! Afer what seems like 30 minutes we are getting bored, and are trying to figure out how to get it to stop. After all why should some other creep get to see the show for nothing? Strange logic, I know.... I rap the contraption on the side, and low and behold...... a dime comes out. A whole dime. We all grab for it, and in our haste it falls through the crack in the boardwalk planks and onto the beach below. 2 of the kids take off to find it under the boardwalk, (hence the title of the famous song is born). When they are gone, I rap it again on the side... this time 3 dimes come out into the little cup on the coin return. Well now we are laughing so damn hard it hurts. More raps.... more dimes. Again and again till our little grubby hands are full of more coins than we've ever seen in our lives. Meantime the other 2 kids are directly below our feet still looking. We are helping direct them... "a little to the left", and "it fell right here". We are filling up our socks with the dimes all the while. Finally the flow of dimes stops. It never occurs to us to split it 4 ways. 2 is better. After all they left us. They come back up without the dime, and shake the telescope in disgust. We walk the rest of the way home trying to hide our "dime" limp caused by the coins sliding in our socks underneath our feet. 2 of us are laughing like hell, the other 2 can't figure it out. The next day, we treat the whole gang to Mr. Softee.... we paid in dimes. I know, I know this seems like a weird one or a stretch for a story, but I swear this is yet another series of childhood memories. Unlike the big plastic cans of today, the olden cans were short, heavy, reinforced steel drums with tight fitting lids. I think they may have been used for coal until home heating oil took over by the 50's?. We had maybe 4 or 5 lining the alleyway to our tenement apartment. Living in an era before computers, cable TV, cell phones, we were always looking for ways to amuse ourselves with what was there. An old broom handle became a bat, old knotted up socks a ball, etc etc. The more I thought about it, the more events those cans spawned. I must have been a small boy of 10 or so, when my buddies and I got our hands on a crab trap. We would go fishing off the Steeplechase pier, and would occasionally hook a big crab, that to our eyes was so mysterious and unearthly looking. The trap was about a 16" wide cube that would unfold flat to 6 sides when thrown into the ocean. We attached some rope and heaved it over the side of the Steeplechase pier loaded with old bait while we fished. It was almost a forgotten afterthought when we pulled it up at the end of the day, and were astounded to find it empty, but no bait. We loaded it again, and next time pulled it up after only 5 minutes. It was totally loaded with 6-8" crabs! Apparently the first time we left it down there too long, and they ate all the bait and left by the time we pulled it up. We ditched our fishing poles and became crabbers. The next hour or so we filled up all our buckets, and several boxes we found with hundreds of crabs. Well this was too good to be true. Us poor Coney kids were getting something valuable and it was FREE! We dragged the booty home. I proudly showed my mom, and she said, "honey these aren't the type of crabs for eating, get rid of them." So what to do? We were tired, lazy, and it was getting dark, so into the garbage cans they went. How would we know there was a garbage strike that lasted weeks? You can't imagine the smell, but the biggest surprise was that they remained alive! Seemed like decades later we could see them slowly creaking their claws. It was quite creepy. We finally relented and carted the stinking mess down to the beach and released them into the water. My fishing luck changed that day forever. Another name for those types of garbage cans was "ash cans". Very appropriate for the next tale. Back in those days late June was the start of July 4th fireworks season. The mildest charge was litte fire crackers. We lit them and ran. Soon afterwards we had contests to see who could hold them the longest before throwing them! Crazy huh? We would light them and then stamp on it the second it would blow. Our fear quickly gone, we advanced to blowing up entire packs at one time. Slow fuses, placing them on toy planes and throwing them off rooftops at night. Man we were nuts alright. The next in the power department were cherrybombs which were much stronger. Finally we came to the "ashcan". This was actually equal to a partial stick of dynamite. Very powerful and noisy. In fact they would blow up under water. We used them to stun and capture bait fish in the lagoons next to the jetty's, but that's another story. Someone came to the ingenious idea of putting one in an empty garbage can. Why one, when we had a dozen? One night we lit them, put on the top and ran like hell. The explosion caused the lid to fly way up into the air like a Frisbee. The sound was that of an atomic bomb to us. The noise was such that it made your ears ring and lose your hearing. In a matter of minutes the police cars were all up and down the block. Not one of us was anywhere to be found until the next day. Garbage can = canon mortar. One of the older kids on the block had the worlds biggest Superman comic book collection. This was the early 60's, and we all read comics voraciously, but he even had the older ones from way way back that we only dreamed of. He never let anyone touch them. They were his children, taking up most of his room. He was one wacky and troubled teenager, and had epic fights with his mother all the time. One day he assaulted his mom and she had him taken away for observation or some kind of treatment. She took all his comics and threw them in those very same garbage cans. When the news got out we were like vultures. I can still see the stacks and stacks of multicolored comics filling up all 5 cans overflowing the tops. Mixed with stinky garbage and all, we dove in like dope fiends. The next day he returned. He attempted to hunt down every last one of those books, but recovered very few. We were scared to death of him, so we read them, and threw them out in somebody else's garbage. Last story. We would sit around the stoop and somehow get a certain look in our eyes. We'd grab one of the smaller guys and put him in a garbage can, and roll him up and down the street. Boy that was mean, but we were kids without computers or cell phones. What else was there to do?